Cuthbert’s Kitchen is a registered 5 star cafe situated within the church building, providing refreshments and a meeting space for church members and visitors. It is open every weekday*, 10.30 am to noon, for coffees, teas and biscuits, and following the 10.00 am service on Sundays. It is also fully equipped for producing meals, and serves a Market Day Lunch every Wednesday from 12 noon to 1.30 pm. Additionally, we can cater for many types of functions and private groups. Given early notice of such occasions we will do our best to recruit staff from our qualified volunteers who will be pleased to help make your event a success. The kitchen facilities can also be booked by outside commercial caterers. We suggest that you initially contact us using the form for emailing on the Contact Us page, putting 'Catering' in the subject line. Alternatively, download a booking form here. You may need to install Adobe Reader to open the file. This can be downloaded from this site. We will normally hold that booking for a week whilst waiting for confirmation. Please note that final numbers must be confirmed at least seven days before the booking and that you will be charged on the basis of the number of people you have booked for even if some do not turn up. Where relevant the menu must be agreed at least one week before the event. Cuthbert’s Kitchen is on the ground floor and is completely accessible. There is a fully accessible disabled toilet and baby changing facilities. We provide self service from the kitchen hatch to an eating area that has approximately fifty seats. We can provide a sit down meal on this basis for between 16 and 50 people. 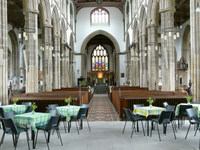 For a stand up finger buffet we can cater for up to 150 people using the whole of the west nave and the north aisle.